These ranges are much more sciencey than others and are aimed more at those with mature skin, and to combat early signs of ageing. I am only 26 but have found my skin is benefiting so much from this already. 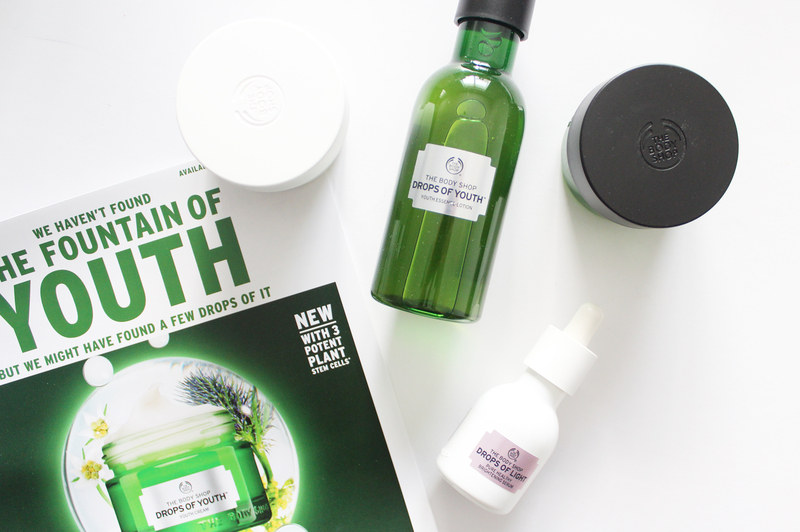 The Drops of Youth range includes stem cells that have their own 'renewal engine', which means they are resilient plants that have survived the harshest of conditions, and basically The Body Shop have broken it down and extracted the parts of these plants that have this extraordinary property. 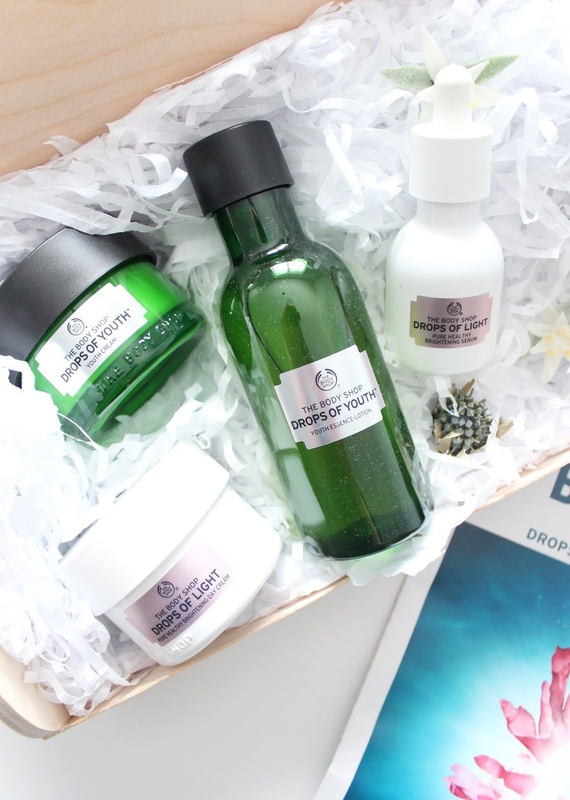 The plants included are Edelweiss, known for its protective properties from the Italian Alps, Sea Holly, for its firming properties, and Criste Marine, which helps with natural skin renewal, both from the Brittany Coast. Although I don't know a whole lot about the technicalities and sciencey stuff that has gone into, all I know is that my skin loves these products. There are six products in this particular range; Youth Essence Lotion ($58.50), Youth Concentrate Serum ($80.95), Youth Cream ($59.95), Youth Eye Concentrate ($61.50), Youth Bouncy Sleeping Mask ($77.75) and the Wonderblur Youth Smoother ($64.95). The price point is a bit higher than your average products from The Body Shop, but when you consider other anti-aging skin care available, $60.00 compared to upwards of $300 isn't much at all. I have been trialling two products that are new to the range. The Youth Essence Lotion* works like a toner, which I apply onto a cotton round and swipe it over the skin after cleansing. It's on the thicker side for a toner, which are generally more light and watery in texture, but it melts into the skin automatically. It gives my skin a hit of hydration, smoothes the skin, and provides an important step in my skincare routine. I've been using it morning and night and loving how my skin looks and feels. The second products I have been using slashed have finished because I liked it so much is the new Youth Cream*. It can be used morning and night, but I have been using it as a night cream only (no reason, simply because I have other products to test!) This has such a nice texture and consistency that just sinks into the skin instantly. It's lightly whipped and doesn't feel heavy, and has definitely improved my skin's softness and texture. I do think my pores don't look as prominent as well! Major thumbs up from me! This is a relatively new range available with the aim to help reduce dark spots, and improve the overall translucency, tone, brightness, and minimise pores. The main ingredient is Red Algae from the North Atlantic, which has survived in these ice cold waters for millions of years. It is rich in minerals, nutrients and Vitamin C, which aids in limiting the process of melanin production that can lead to dark spots on the skin. There are four products in this range; the Clarifying Foam Wash ($45.50), Pure Translucency Essence Lotion ($59.95), Pure Healthy Brightening Serum ($81.95), and Pure Healthy Brightening Day Cream ($63.95). The Pure Healthy Brightening Serum* is the hero product from the range, it's a lightweight water like texture that only needs a few drops to be effective on the skin. It can be used morning and night, and so far I have really been enjoying it. I have quite a few acne scars but this is definitely aiding in making them not look so dark and prominent. 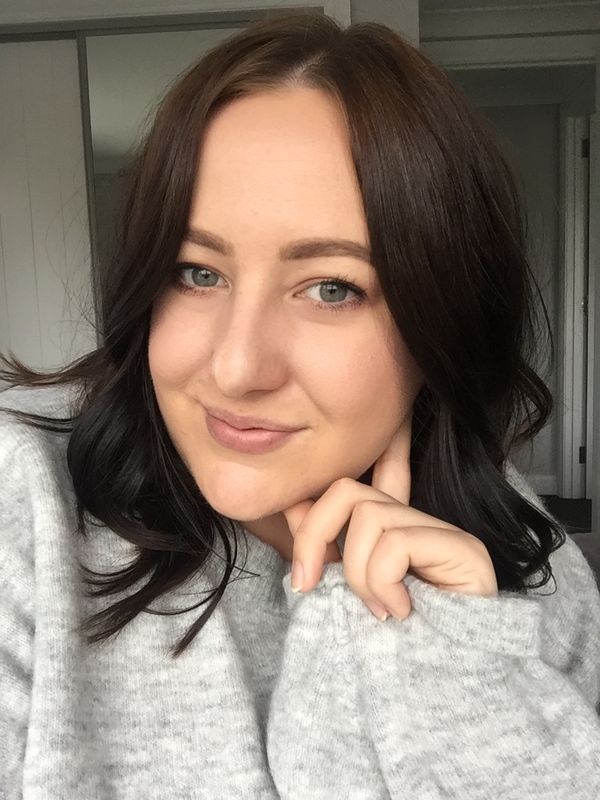 The Pure Healthy Brightening Day Cream* has been my go-to for the past few weeks and works so nicely as my daily moisturiser. It is on the thicker side, but the texture is lightweight and it doesn't leave a greasy film on the skin and works well under makeup. In conjunction with the Serum, this could have some amazing effects to the skin. I need to continue using it to really see an overall difference but for the meantime, I can definitely vouch that my skin looks a lot better and feels better too. If you are willing to spend a bit more on your skincare routine, I would really recommend these two ranges. I can tell that there are products here that I will not want to be without and will definitely be purchasing. I would say aged 30+ would benefit greatly from the ranges, although I fall under this bracket I have noticed a difference overall. Have you used any of these in your skincare routine?